To which I might add just! This is a curious custom where part of the tradition remains, but aspects of it appear to have disappeared. 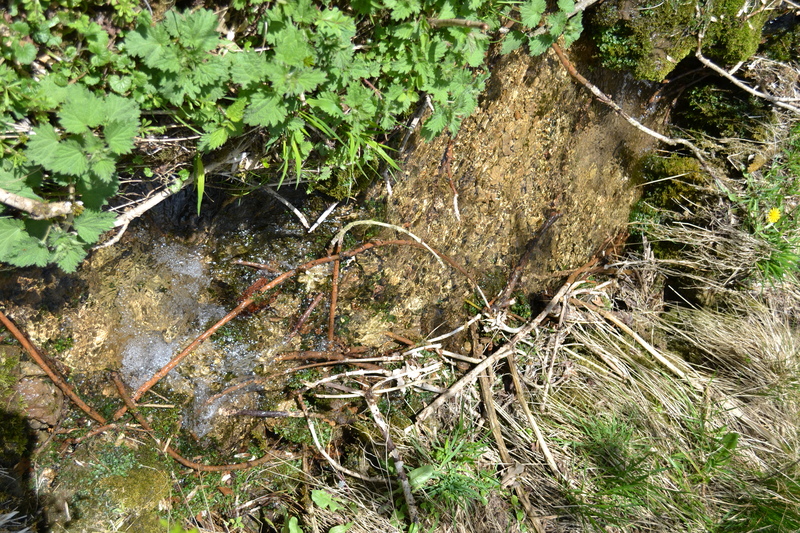 The custom apparently was established to provide access of the local parishes adjacent – Leafield Five Ash, Charlbury and Finstock particularly – for the collection of wood and the visiting of the springs and wells of the estate. It is the latter of which is of considerable interest. If you go down the woods….. But why? The name the ‘Secret Forest’ was part of the appeal no doubt. It was a forest which could only be visited on Palm Sunday each year. Any other time of the year it was strictly out of bounds. Everyone loves a mysterious place and getting access to it was part of the allure. “Hast then a wound to heal; The wych doth grieve thee? The Cornbury Map showing route directly to Iron Well. On entering the estate I still noticed that the route outlined still made a bee-line to the Iron Well. 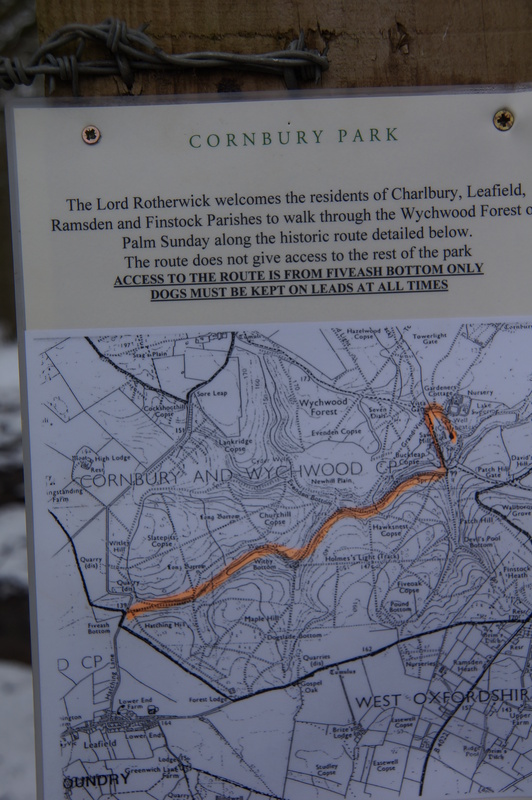 The route had been diverted and I easily found my way in courtesy of a man who did the walk every Palm Sunday. I made my way at first to the Iron Well. I wasn’t convinced to drink the water..it certainly lived up to its name, having a reddy-orange scum on the edges – it didn’t look very appetizing. Entering the park I first made a slight detour to see the Cyder Well, which poured out a considerable flow of clear fresh water. 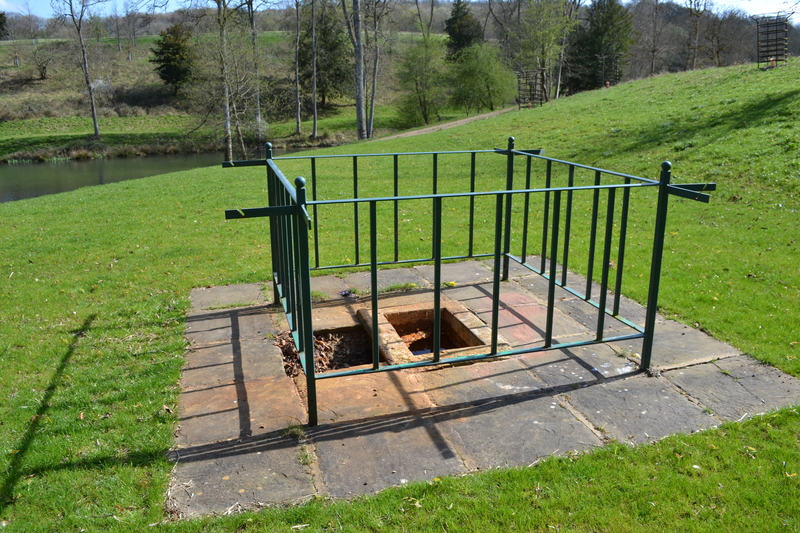 However, I thought I would leave my Spanish water experience to the main well which was associated with the tradition – the Wort well. This was the less impressive of the springs but the easiest to determine the spring source. I lowered my bottle and filled it. Popping in my liquorice and giving it a shake I took a slip…it was refreshing but I could detect no real flavour. However as I progressed back along the path regular sips revealed a more flavoursome experience. By the end it was rather delicious and I regretted not filling more bottles or having more liquorice. However, talking to local people they stated that they had had 100s of years of access on the date. In the church at Charlbury, I fortunately met Mrs Fowler. She informed me that visiting wells for Spanish Liquor was still very common up until in the 1980s. She and her husband remembered that a Royston (Dobber) Scroggs, a Cotswold Warden, would stand by the well and tell people the history. This is no more. Wandering around I watched a number of people on my journey around, of which only one came near to the springs…although they did fill a bottle and drink it. They did not have any liquorice though…Fortunately I did and it tasted rather nice. Cannot see the wood for the trees. And so that signing lead to the opening up of a permanent footpath, from Patch Riding, Finstock, to Waterman’s Lodge, near Charlbury, through the estate in 1990..the one I used to access the permissive path. It may be only one, but like any incision, it allowed greater access and so the mystic began to fade…but not quite yet. 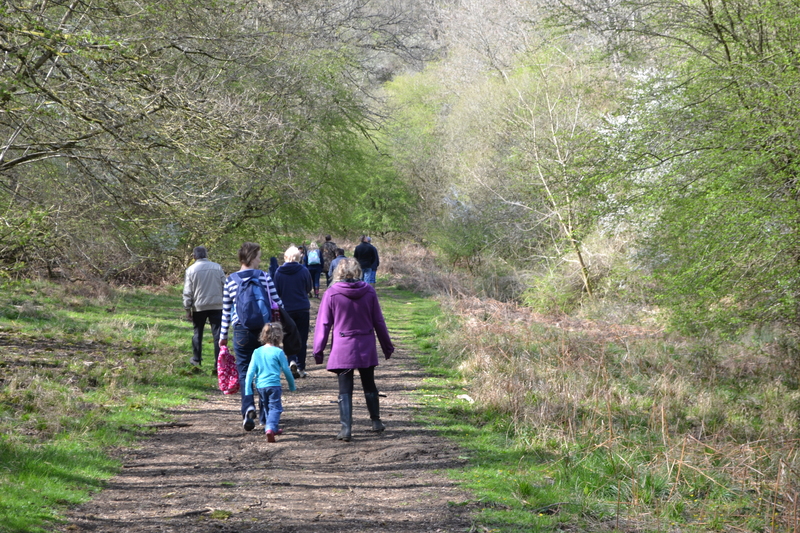 It was clear that Palm Sunday I went that a considerable number of local and not so local people were still keen to see the vistas and green swards generally unavailable. The estate covers a considerable area and the footpath only crosses a very small section. He remarks he saw few people despite doing a complete circuit! Indeed, when I arrived I found the traditional route sadly blocked and plenty of walkers appearing and then turning around scratching heads and moaning. However, at least access remains whether people take the waters or not…plenty enough people were happy to ensure that the custom of walking the path remained. However it would be nice to see more Spanish Water drinking. The is especially significant when if you visit many wells you can find the tradition of tying objects, called clooties to the trees, a tradition foreign to many places it is now found. It would be better to see the revival of more native traditions such as Spanish Water drinking – at this site I can safely vouch for its safety of drinking its water. So if you are in the area please keep the Spanish water alive!